When actor Hyun Bin enters into military service, girlfriend/actress Song Hye Gyo will not be present. His best friend/actor Jang Dong Gun will also not be present. Also, Hyun Bin revealed recently, “There is a girl I am dating” – confirming his continued relationship with Song Hye Gyo. However, Song Hye Gyo will be filming for her movie “Today“, so she will be unable to directly say her goodbye to Hyun Bin. Hyun Bin will enter the marines on March 7th at 1PM at Kyungbuk Harbor Ocheoneup to receive 5-weeks of basic training. 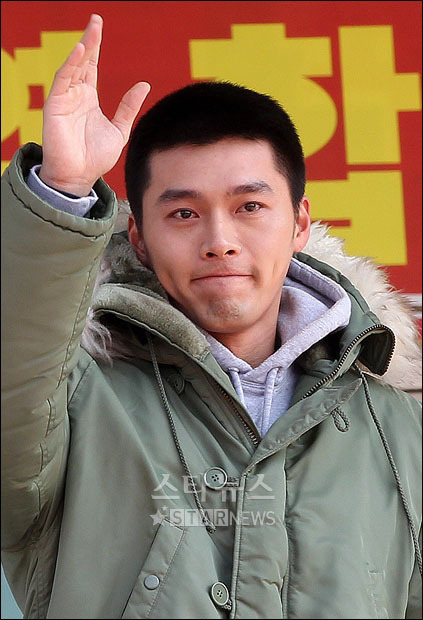 At 1:30 PM KST on March 7th, actor Hyun Bin (29) enlisted with the marines training camp in Segyeri, amidst the support of over 700 fans and reporters. For a total of seven weeks, he will receive basic training before beginning his 21 months of service. His date of discharge has been set for December 6th, 2012. After greeting fans, Hyun Bin excited fans by revealing his buzz cut, before bowing deeply on the floor with tears in his eyes. Fans showed their avid support for the actor throughout the event. 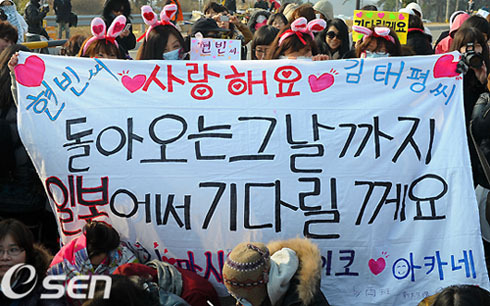 Large banners were held up everywhere, and cars were restricted from parking near the entrance Hyun Bin was expected to walk through. In order to avoid distracting Hyun Bin’s fans and reporters, his young marine juniors entered through a different entrance. Hyun Bin’s girlfriend, Song Hye Kyo, was unfortunately unable to accompany her boyfriend to the office because of her filming schedule for her new movie, “Today.” However, we’re sure that the actor was still greatly warmed by the energetic sendoff he received. On March 8th, the agencies of actor Hyun Bin and actress Song Hye Kyo officially announced that they had broken up in January. “We would like to inform the public that Hyun Bin and Song Hye Kyo decided to part ways earlier this year. The two met in 2008 through the drama, ‘The World They Live In‘, and carefully acknowledged their love soon after to the public. immediately removed the cap and showed his new short hair. Seeing Hyun Bin holds hands with one of his fellow Marine Corps, that soldier must be laughing inside? I wonder if his name will appear in news soon as ‘the mysterious man who was holding Hyun Bin’s hand’? aaaaaaaaaa exw rixei TO klama! What can I say, Hyun Bin is Hyun Bin, he is looking good here, as usual. Today is Hyun Bin’s day, just when I thought he is out my system. 8th, how can we just let Hyun Bin off the air? So ladies, here is the Vogue photo shoot behind the scene clip for its 2011 March issue, featuring Hyun Bin and Tang Wei. καλά που φεύγει φαντάρος, γιατί αλλιώς θα του ορμούσαν όλες οι Κορεάτισες!! How many ads have you done, Mr. Hyun Bin? But, I am so glad you have done all the commercials, something for us to enjoy while you are training hard to be a better man! messages to be communicated to the market. from all angles, what more can I say! 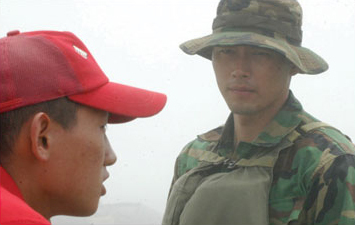 Hyun Bin, looking good as a Marine! released on 22nd of March, I have been waiting to see this for sometime! How does he look in uniform? This soldier does not disappoint his fans by a bit! On 24th of March, via official site of ROKMC, a group photo featuring Hyun Bin with his other 21 mates from Platoon 1137 is published and later featured in the news. On 31st of March, photos featuring Hyun Bin are released via Marines official site. 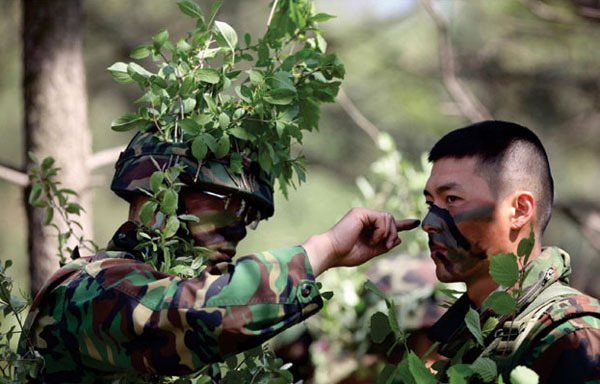 We see Hyun Bin in action among many other trainees, undergoing some serious training to be a Marine corps. Next month, actor Hyun Bin will be featured in a special book titled “I Am a Marine“.